Salt water is good for . . .
My mom always said that saltwater is good for the sinuses . . . I believe it is also good for the soul. Yesterday, we went to surf but the tide and conditions just weren't right. It was thumping and we knew that our surf session was going to be more like a beat down session. I told the guys that I would enjoy the sunshine and take photos and videos of their surf session. After another set thumped through the surf zone, they suggested that we go rock gardening instead. Off to Noyo Bay, we went. The bay was much calmer than the beach that we were scouting to surf, but still had a few good sized sets rolling through. I was lined up to ride one of our favorite pour-overs when the wave of the day came. I watched it hit the indicator rock and said to the guys - "Whew this is a big one" and antied up for the ride. This particular pour-over has a large hole that opens up on its backside that would have any class V whitewater river kayaker portaging. However, the ocean is a different animal. I knew that this frothing pit might swallow me up, but it would magically let me go. Way up over the rocks I launched on my wave (probably only about 10-12 feet at the top of the wave). However at the top of that wave, I was staring down a steep tongue like drop of about 15 feet that slid into a foaming throat. Fortunately, my timing was perfect to be sitting on the peak of the wave. As I sat at the top of the wave, I could have selected to go right and take the soft fluffy elevator ride down the backside of the wave, but today I was charging it and went for the big drop into the hole. The ride down the tongue was exhilarating and then the churning hydraulic hole below swallowed me up. It tossed me toward the rock wall that I had just hurled over then tumbled me over the lower side of the pour-over. Being upside down and being washed about over a pour-over isn't necessarily the funnest rock gardening situation to be in. At one point the whitewater sucked and pinned me on my side. The power of the water had me in a limbo land of not being upside down but not being right side up. I could feel the sun shining on my face through a layer of water. As I held my breath, I felt safe in my mermaid boat. (We refer to my kayak as the mermaid boat because of its sea foam green color and my affection for it being an extension of my body). There was so much water churning about that my body didn't touch the rock that I was being worked over. I felt a little water leaking through my sprayskirt into my boat but held out for Neptune's release. I waited . . . it washed me over the pour-over again. I felt my paddle clear the foaming whitewater and rolled up. "Cate's got Heart," Nick declared. Yes, yesterday I did have heart. And today my sinuses are still draining salty goodness. What to do River Otters Eat? 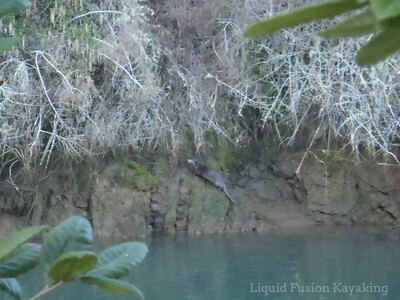 As we were finishing up our day on the Noyo River, we were delighted with the appearance of a river otter. One never knows what these rascally mammals are going to do so I grabbed the camera and followed as it cruised along the bank of the river. Jeff had noted a western grebe around the bend and commented that the otter was probably hunting it. Sure enough. As the otter came around the bend, the grebe became alarmed and dove. The otter floated in the current like a small log closer to the grebe. We have had a lot of debris in the river from heavy rains and a high tide so it was perfect camouflage. The otter dove and the grebe dove again and next thing we knew . . . the otter came up with the grebe in its mouth. Here's the video of the otter with the grebe. Turn your sound off if you don't want to hear the bird's calls of alarm. It took the otter several minutes to kill the bird and then he took her up the bank . . . for dinner by the river. Kind of gory, but nature on the water before our eyes. 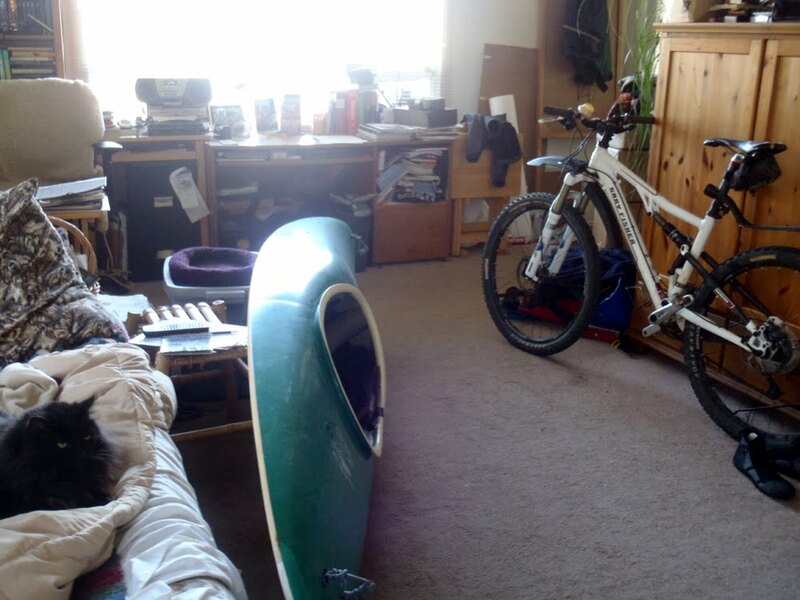 A friend stopped by the house this week and commented, "There's a kayak in your living room!?!?" 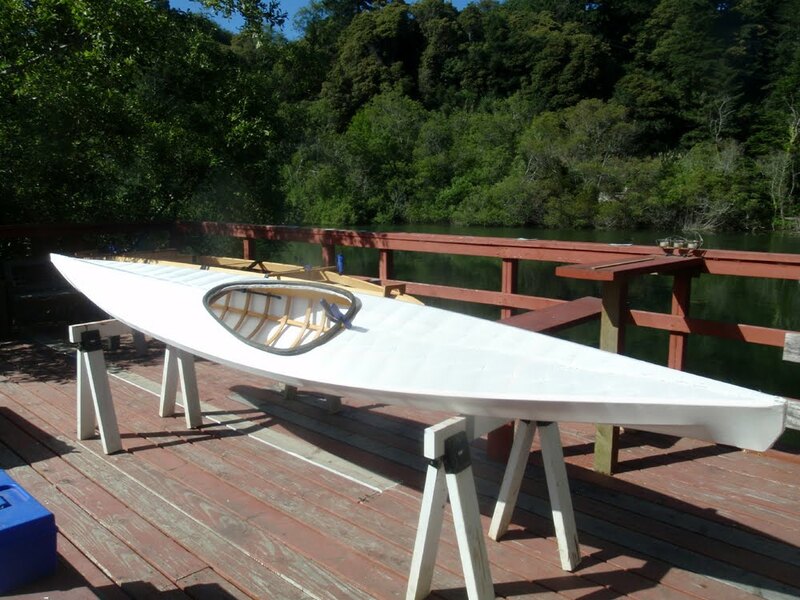 My surf kayak is in need of an outfitting makeover. The duck tape foam paddling was a bit too loose on my last surf session. When you have to hold your legs a specific way to keep the foam in place defeats the purpose of the foam outfitting. I also feared that a swim would result in a mini-cell foam flotsam party in the surf zone. For me, outfitting a boat is a tedious and frustrating process. I figured at maybe doing it in the warm comfort of my living room with a tasty beverage might make the process go better. So the Mini Mako is in the house for an outfitting make-over. Think I can get it in the living room? And so much more fun to come!